I’m gluten-free so quinoa is part of my everyday life, but I think most gluten eaters appreciate quinoa the most on Passover, when more mainstream grains like wheat, barley, and rice are off-limits. 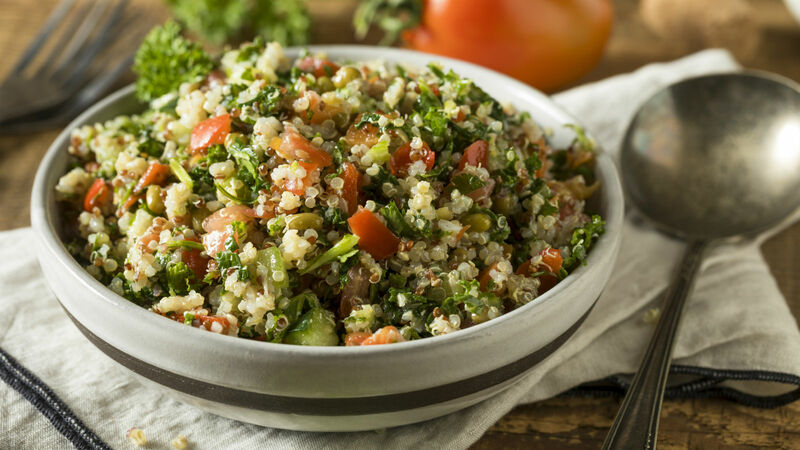 This quinoa salad is very versatile in that you can use pretty much whatever vegetables you like depending what is in season. Here I do a roasted veggie medley of sweet potatoes, onions, zucchini, and bell peppers, but asparagus, tomato and scallion would be just as delicious. Preheat oven to 400 degrees and grease two baking sheets. Spread sweet potatoes and onions on one baking sheet and zucchini and bell peppers on another. Drizzle 1 Tbsp of olive oil over each baking sheet. Roast zucchini and peppers for 10 minutes, sweet potatoes and onions for 25 minutes. Remove to a large bowl. In the meantime, place quinoa, water, and 1/4 tsp salt in a small saucepan. Bring to a boil, then reduce heat to low and simmer for 10 minutes, then remove from heat and rest for 10 minute before fluffing with a fork. Whisk together lemon juice, olive oil, salt, and pepper. Add quinoa to vegetables and drizzle dressing over top, mixing to combine. This bright summery dish can be spruced up further with figs, plums or peaches. The flavors of this light salad develop more completely the longer it sits.